Good Morning Trouble and troubled listeners another lovely day on the west coast! Sorry, it's uncharacteristically good weather for the PNW! Morning everyone! Nice snowy day for a change here in mpls. Perfect environment for this wonderful Feldman piece! What's this I hear about National Pancake Day today? When was that law enacted? Geez and I only had oatmeal like a jerk. Um, the day was established in 1955 thanks to the influence of the powerful Bisquick lobby. Not to be confused with Maundy Thursday, another Pancke day. Since it's supposedly Jesus' last Pesach, those "Pancakes" are probably matzos. Spring reverb brings the promise of spring. maybe Jesus had matzo brei!! Ever translated the lyrics to this Serge number? I kind of like this husky Trouble voice. is the drawing by Michele from SUW? - you go to links on Michele's profile though - she does have mad representational nature drawing skills. thanks pat! 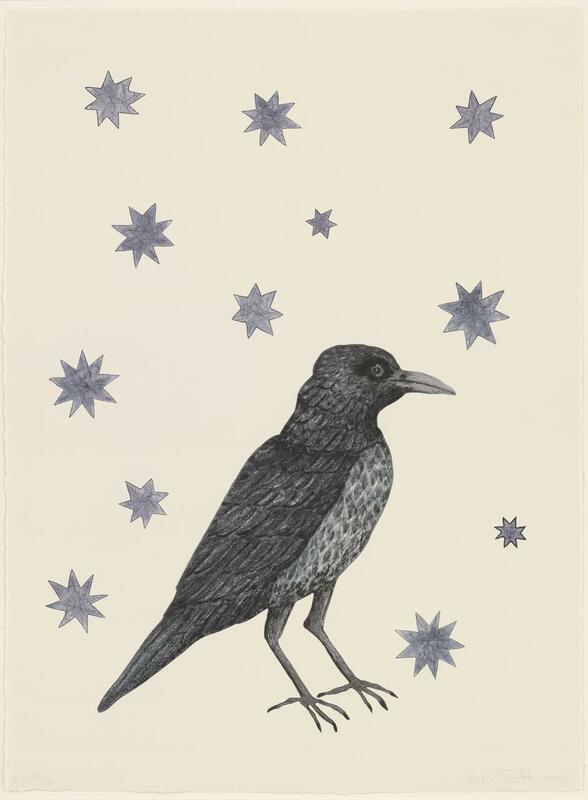 yes today's artwork is by Kiki Smith. Bonjour Dj Trouble and Troublitaires ! Trouble, see you're deep in the Arthur Russell territories. How'd you like the documentary? Trouble - you are channeling my crow obsession of late. Did you see this article/podcast about crows that leave trinkets for an 8 year old girl who feeds them? Lovely. Be sure to ask Liz Berg about that crow sampled song she played a while back. Oh, no worries, it's well worth the antiscipatory build up. yeah, my 1st panda bear on wfmu. what a feeling ! Kes really is a beautiful film. I usually get choked up just describing it to people. @mary - thanks for that link. Will try and check it out. Tuesday , named after Tiw, the god of Dub. Buffy Sainte-Marie, so special thanks! Hate to be THIS guy, don't want to be THIS guy, but isn't it JEAN-Pierre Decerf ? Hello Trouble...hello Freeform Nation! Are we all getting ready for the marathon??? ALWAYS FUN...BEST IN THE NATION!!! So this is what it feels like inside a snow globe. . . This Aine O'Dwyer is something special. came to comment that the frightening lights "humankind" track was gorgeous! good show! That was weird, I just automatically got thrown back to last week's playlist. north guinea hills: while you were listening? how are you listening? The music didn't change, but I was on this playlist, and it randomly went back to last week's playlist. I've never had that happen before. (I was attempting to starry click a song). Recently saw this for the first time, what art! maybe it was the wayback machine. So glad to listen to your show today. There's a link with title "Previous playlist" near the top, on the left. Maybe the mouse pointer jumped there momentarily? Hey trouble and everyone. This is my first wfmu program, hearing over the fm frequency, in a month. Very possible, Ken, as my GUI has been acting a bit erratic lately, although, at the time, I was trying to click on something on the bottom of the screen. Get some rest, Trouble and hope you are better for the Marathon slog. See you next time! I'm off for a walk in Central Park. Great show Trouble! for once the following conditions present: boss is out on a Tuesday, and I remembered to tune it in! things look very pink today! hello trouble! Thanks Trouble, have a great day!